Fretwells came to America from England in the late seventeenth and early eighteenth centuries. The most prominent Fretwell group on this web site came to Essex County first, then moved on to Louisa, Cumberland, Albemarle and Buckingham Counties in Virginia. 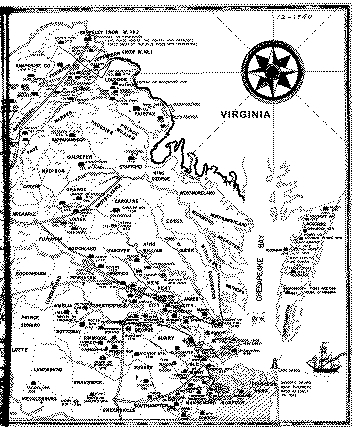 [ Part of ] A Map of Virginia. 1656 - 1941. Drawn by Douglas SummersBrown and Helen L. Smith. Published in the Encyclopedia of Quaker Genealogy. Vol. VI. Showing major rivers in Virginia and Highways of 1796 with a focus on the counties of Middlesex, Essex, Louisa, Albemarle, Cumberland and Buckingham. Click for a larger view of the map (1MB file). You are visitor to this site since April 22, 2003.